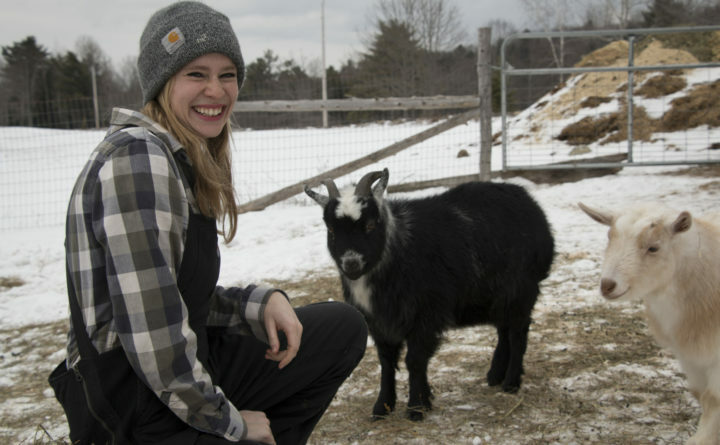 Kirsten Lie-Nielsen, the author of "So You Want to Be a Modern Homesteader" and "The Modern Homesteader's Guide to Keeping Geese," interacts with her Nigerian dwarf goats on Jan. 16, at her homestead in Liberty, Maine. She is also the author of a blog about homesteading at hostilevalleyliving.com. The farmhouse had been empty for 30 years. Built in the 1860s, the building had no electricity or running water, the surrounding fields were overgrown with brush, and a giant Yankee-style barn on the property was filled with animal waste and discarded equipment. Yet to Kirsten Lie-Nielsen and her partner Patrick Jackson, the old farm looked like home, a place where they could pursue their homesteading dreams. In 2016, the couple moved onto the property, deep in the woods of Liberty, and got to work. They were prepared to “rough it,” to go without modern conveniences, but the journey wasn’t without its hardships. "So You Want to Be a Modern Homesteader? : All Dirt on Living the Good Life," by Kirsten Lie-Nielsen of Liberty, Maine, published in November 2018 by New Society Publishers. 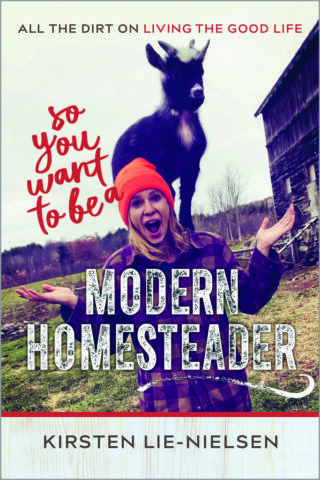 Now three years later, Lie-Nielsen is sharing these experiences and all she has learned along the way in her latest book, “So you Want to Be a Modern Homesteader? : All the Dirt on Living the Good Life,” published by New Society Publishers in December. Written for the homesteading beginner, the how-to style book offers tips on everything from finding the ideal homestead property to selecting firewood and selling vegetables. This is Lie-Nielsen’s second book. In 2017, she published “The Modern Homesteader’s Guide to Keeping Geese,” and she has written numerous articles on homesteading and farming for major online publications, including Grit, Mother Earth News, Backyard Poultry and Hobbyfarms.com. And she runs a successful blog about homesteading at hostilevalleyliving.com. What is a modern homesteader? Prior to moving to Liberty, Lie-Nielsen and Jackson ran a little hobby farm in Bath, where they had two gardens and kept various types of poultry, including geese. But they were cramped for space, with neighbors crowding in on three sides. “It felt very much like living in a fish bowl,” she said. When they made the move to the old farm in Liberty, they were willing to sacrifice modern conveniences for a time in exchange for privacy and space — 93 acres to be exact. There they purchased a small herd of Nigerian dwarf goats to produce milk and clear brush, and they added to their flock of geese, chickens, ducks and guinea fowl. They also set to work fixing up the barn and house. 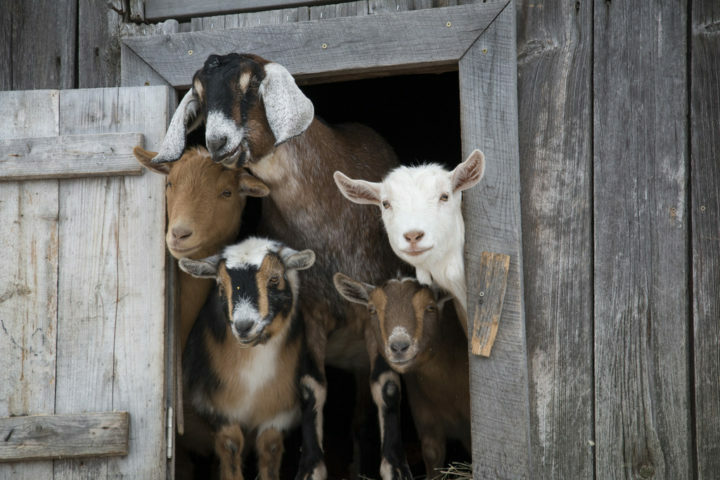 Goats poke their head out of a barn door in Liberty, Maine, on Jan. 16. Prior to being abandoned, the farm had been in the Whittaker family for more than 200 years, so locals referred to it as “the old Whittaker place.” But as Lie-Nielsen and Jackson restored the property, they decided to assign it a new name: Hostile Valley Farm, which is located on Hostile Valley Road. Some would say that the couple’s move to the old farm marked the moment when they officially became “homesteaders,” but Lie-Nielsen would disagree. In writing her most recent book, she thought a lot about what makes a person a homesteader, and she came up with her own definition. Lie-Nielsen’s readership has only reinforced the idea that homesteading can take many forms. The people who follow her homesteading journey on social media are from all walks of life and living situations, she said, as are the people who have recently attended her book talks on homesteading and geese. Yet they are all interested in developing certain homesteading skills, whether that’s making goat milk soap or planting an herb garden. Kirsten Lie-Nielsen greets her goat herd on Jan. 16 at her homestead in Liberty, Maine. She authors a blog about homesteading at hostilevalleyliving.com. When Lie-Nielsen brings her fluffy white sheepdog Stanley on a walk, they can go for hours without ever leaving her property, and every time, they seem to discover something new — a grove of trees or a brook or an old rock wall. In the three years she has lived on the property, simply taking a walk is still a special experience. The freedom and peacefulness of country living hasn’t grown old, she said. But it also involves shoveling a lot of animal poop. In her latest book, she discusses it all — the tranquil walks and the backbreaking farm chores — in an effort to give readers an accurate idea of what homesteading may entail. “Some have this idea of going to the country and communing with nature, but there are a lot of things to consider before making that leap,” Lie-Nielsen said. This past summer, Lie-Nielsen and Jackson lived in a tent while they completed major construction on their old farmhouse. It wasn’t easy, she said. That kind of living is not for everyone. But now their home has running water and electricity, the walls are well insulated to fend off the winter, and their new sunroom is the perfect spot for her to work on her writing. Each challenge seems to have its reward. 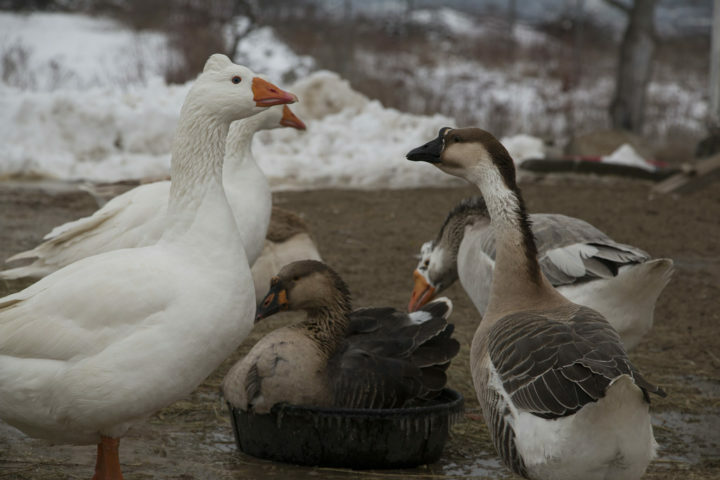 Geese gather around containers of food and water on Jan. 16, at the homestead of Kirsten Lie-Nielsen. This winter, Jackson is clearing forestland to create more pastures. In the spring, the couple plans to plant elderberries, expand their orchard and purchase pigs to root out stumps on their newly cleared land. They also anticipate the expansion of their goat herd, since several of their goats are due to give birth in May. One of her goats, in particular, has received a host of fans. His name is Lucky, and when he was born, he weighed just 1 pound and his legs weren’t working properly. Kirsten Lie-Nielsen greets her goat herd on Jan. 16, at her homestead in Liberty, Maine. With black shaggy hair and white markings on his head, Lucky slept in a basket beside their bed, and during the day, Lie-Nielsen brought him to work at her family’s store in Warren. In her book, Lie-Nielsen describes all she has learned about using social media to share homesteading, its pitfalls and its rewards. She also talks about the benefits of focusing on certain aspects of homesteading rather than trying to do it all. 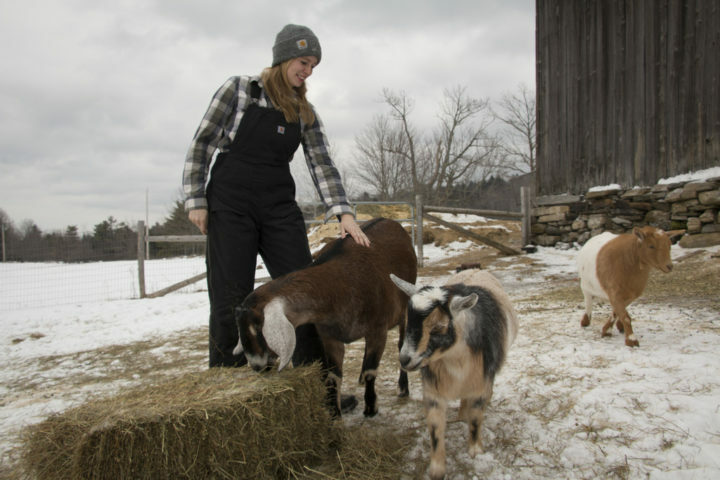 For Hostile Valley Farm, the focus is currently on goats, poultry, berries and their orchard. But for another homestead, the focus may be on honeybees, sunflowers and pigs. Some homesteads may choose to have no livestock at all. Every modern homestead is different, Lie-Nielsen said.